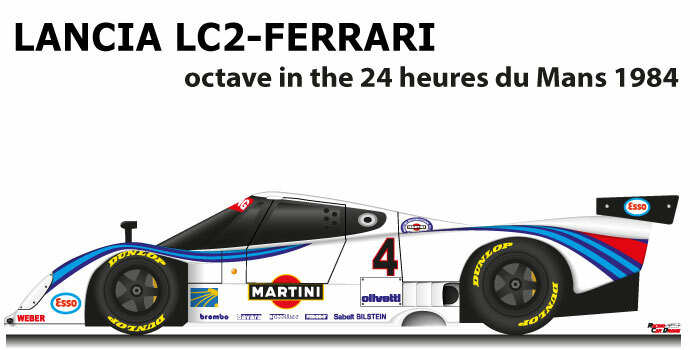 The Lancia LC2 – Ferrari n.4 is a prototype that participated in the 24 Hours of Le Mans in 1984. After the experience with the LC1 the Italian manufacturer directed by Cesare Fiorio, he built a car for the Group C category. The LC2 had the closed cockpit was equipped with a 3000 cc Ferrari engine. Bob Wollek and Alessandro Nannini driving the Lancia LC2 -Ferrari n.4 came in eighths at the 24 Hours of Le Mans in 1984. Despite the start in pole position and the fastest lap in the race, the two riders of the Italian team had mechanical problems that they slowed them down by a gap of thirty-four laps from the Porsche 956B n.7 of Henry Pescarolo and Klaus Ludwig who won the race. During the season the Lancia LC2 also won the 1000 km of Kyalami with Riccardo Patrese and Alessando Nannini, the race was valid for the World Sports Prototype Championship. Transmission: Hewland five speed Manual.